Quickly and easily remove stains from plastic, china, porcelain, and more with the Noble Chemical Oxy Dip presoak and destainer! This two-in-one agent utilizes the deep-cleaning power of oxygen to remove stains from a wide variety of materials in your business. 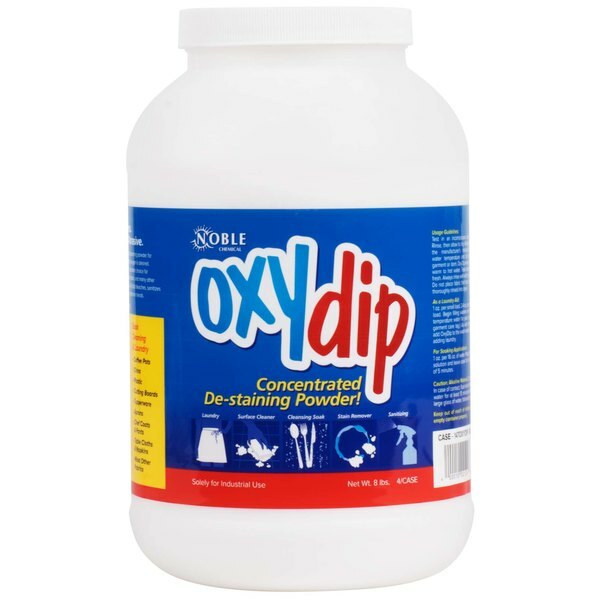 Oxy Dip's specialized formula makes it an ideal solution for any stained surface without hurting the surface itself as it bleaches, sanitizes, and cleans all at the same time. It's safe for use on colors, and it can even be used in laundry, carpeting, upholstered furniture, coffee pots, cutting boards, and more! The odorless and tasteless formula ensures Oxy Dip won't affect your customers' enjoyable experience at your business, and because it comes in such large quantities, you can tackle lots of stains with just one order.